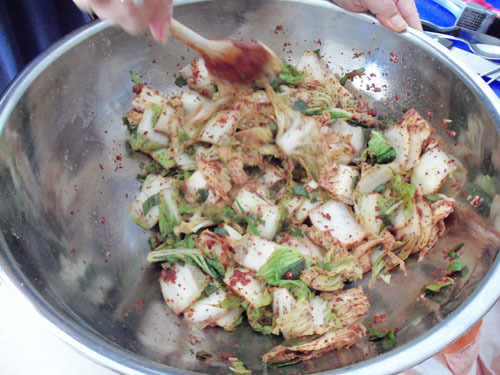 This weekend my mom showed me how to make kimchee. It turned out to be a lot easier than I thought it would be. I took pictures for reference later however. I could have used a smaller jar for this batch. We also made a batch of the radish kind. My mom doesn't really measure stuff so I had to eyeball everything. This is pretty loosey goosey but here is the recipe. The radish kind is our all time favorite. Same recipe with daikon radish, yes? We're super excited to make this and we don't mind the loosey goosey recipe. Thanks! YUM! Looks simple enough to make, my bf can't stand the smell of it though. I like mine super sour which usually means the smell is a lot stronger. Thanks for sharing the recipe. I just got a radish kimchee from Lee's Oriental Store. It was yummy. I will be trying your recipe soon. catiecake - yes, we used daikon radish for the radish kimchee and the ingredients are the same - you just have to eyeball the amounts. when you say "keep it out of the sun" that means not in the fridge, right...like just put it on a shelf or something? I'm excited to try it. d - right, set the jar in a cool spot out of the sun for a couple days then put it in the fridge. We didn't use anchovy sauce, though, which will delight my vegan/vegetarian friends. Heh. I so love that I can make my own now. I too had to take great notes and make sure to eyeball everything. My mom doesn't use measurements at all when cooking. My grandma in Korea places her kimchi in these special pots (hang-a-ri) and they keep them cool and out of the sun. 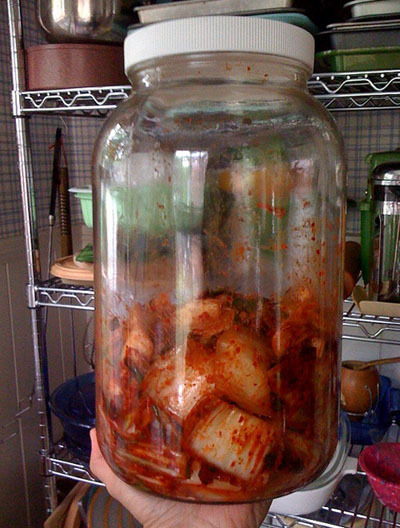 There are special kimchi refrigerators to help them last longer. Looks delicious, but I hear it can be pretty spicy! I don't think my stomach could handle it. I don't know if sugar is such a secret. I've been watching Maangchi on YouTube making Korean food and it seems like she puts sugar in EVERYTHING! 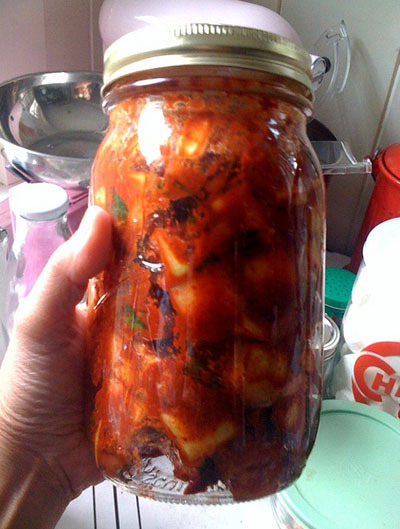 I can't wait to try making my own kimchee. Thanks for the recipe! my mother omits the sugar, and sometimes add sprite instead! that's her secret ingredient. What is the hot pepper powder? Is that just what it's labeled at the store? Excited to try this and glad you linked back to it! Krista - at the store the hot pepper flakes will be called Gochugaru. Hope that helps!